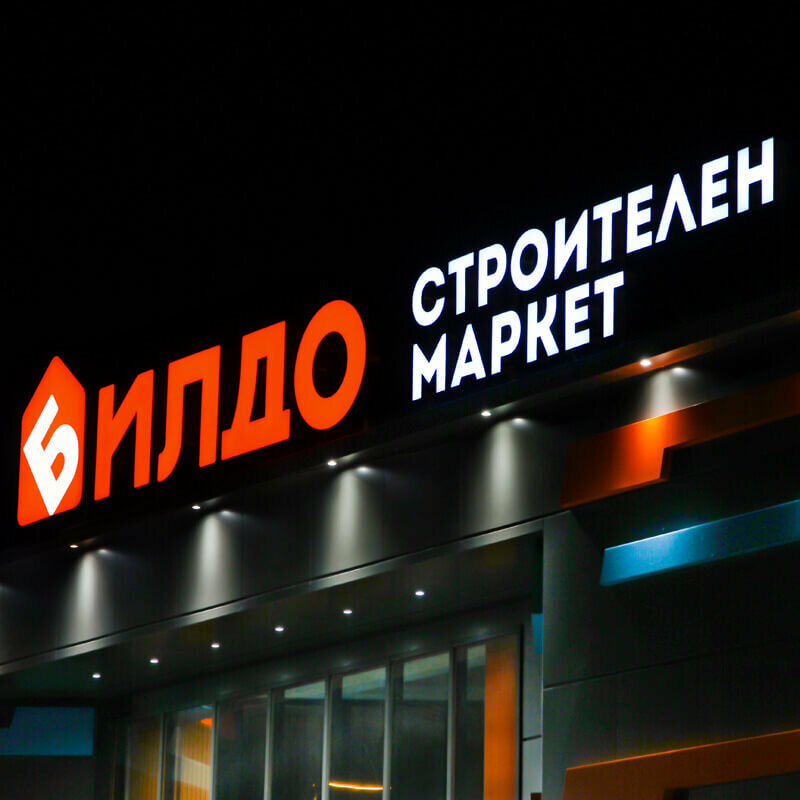 For the new Doormann showroom in Plovdiv we have created attractive LED illuminated channel letters from acrylic. They are part of the overall branding of the site with outdoor advertising. The letters Doormann Doors are entirely made of acrylic, with a blue and red translucent film applied to the face. The channel letters are good-looking, thanks to the fine and precise workmanship that allows this material. This makes them very impressive and helps for the better presentation of the brand. To be equally remarkable at night, we used the high-quality illumination G.O.Q. LED that glow brightly and consume a minimum amount of electricity. One of the Doormann Door signs is located on a metal construction on the building’s lean-to and the other one is place on a base of composite panel, which is part of the store’s lining. In order to complete the vision of the showroom, we lined the columns and the store’s lean-to with red composite panel. We also wrapped the windows with advertising film labels. 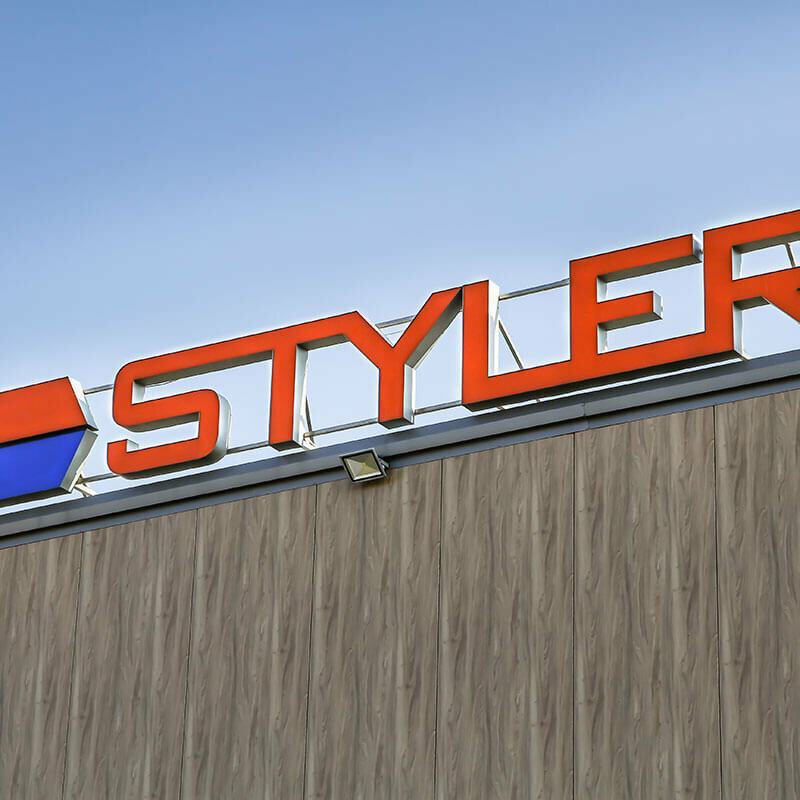 The Media Design capability to fulfill the overall concept – the self adhesive film window stickers, lining the facade with composite panel, the production and installation of illuminated LED channel letters, we guarantee the seamless communication and complete external repair of the store. Thus, warranties and subsequent maintenance are clearly and precisely defined.